Halloween night was very exciting! 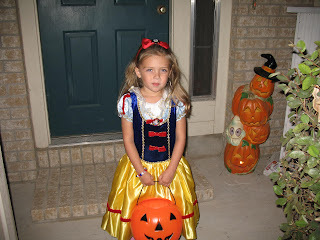 Our beautiful Snow White and little Cowgirl had a great time trick or treating. 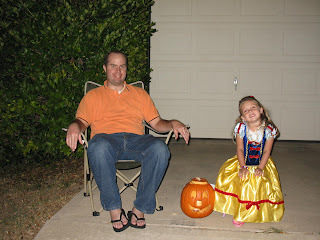 When we got back Jaeden and Dan sat out on the drive way passing out candy. 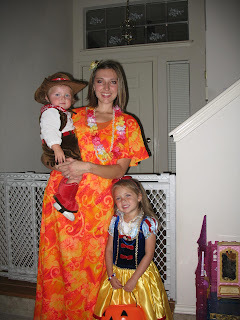 Jaeden loved every minute of it and gave half of her candy away too, she didn't want to stop. I hope everyone had a wonderful Halloween night!! Aloha mrs. Hawaii!! You guys re soo cute! I love to look at your blog since I hardly ever get to see you. I have a blog too if you want to check it out. You can call me or mary for the address! Love ya ange! Hey you guys look so cute for Halloween. What's Dan supposed to be? 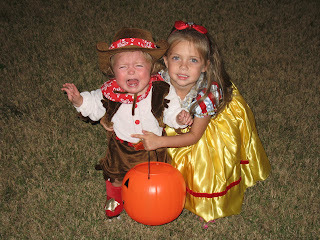 I love the little cowgirl and Snow White. What would it be like to dress little girls? Maybe someday I'll know! holy hannah!! look at your face. You are so stinkin skinny!! help me please!! you and your family are the cuttest!! i love your costumes. delicious!